The 1212 patterns are a sub-group of normal patterns. They are started using equally many strings of two colors. Every other string should be in color 1 and the others in color 2. The 1212 patterns is tied using forward-backward and backward-forward knots only. 1212 patterns are easy to design if you only want to use 2 colors. Frankly, you can set any knot to either color 1 or color 2 as you wish, without any "planning" as normal patterns need. An alpha pattern is characterized by the horizontal lined up half-hitch knots. The bracelets are most often in two colors as the difficulty rises drastically rises when using more. The word "alpha" is a short word of "alphabet". The alpha patterns got their name because it is easy to make a bracelet with alphabet letters on it. The alpha bracelet is tied using one string in the "background" color, and the rest of the "letter" color. The bracelet is tied using the background color string in every knot, from left to right, then right to left and alternating like that on every row. The alpha patterns are easily designed using a simple grid paper, or a graphics program with a grid. This bracelet is made by making some rows of a chevron bracelet, then splitting the bracelet into two Chinese staircases, then making chevron again, and so forth. The result is something that looks like a small ladder with broken steps. The bracelet needs to be fastened on the arm somehow. The easiest solution is by just tying the bracelet on, using the start- and end strings. There are many other solutions for buckles. 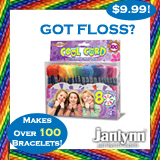 They may include metal clips, beads or just strings. Take a look at the tutorial Bracelet Buckle to learn how to make one of these buckle types. Another word for Arrow bracelet. See pattern #2. 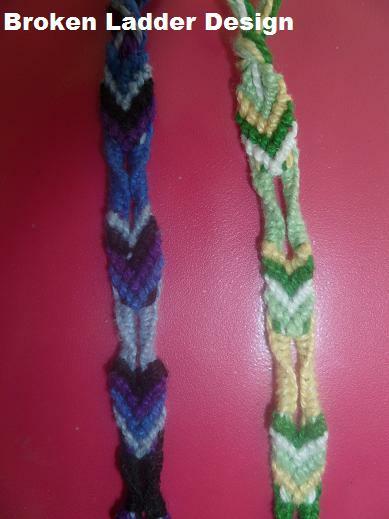 A very simple friendship bracelet consisting of about 3 to 10 strings in different colors. Only one knot is used; the forward knot. The idea is simple: make X forward knots around all other strings, change string, repeat. Crochet thread is specially formulated thread usually made from mercerized cotton for crafting decorative crochet items such as doilies or filet crochet. Crochet thread produces fabric of fine gauge that may be stiffened with starch. This type of string is often used when making friendship bracelets. To design an own pattern is not the easiest thing. After making several patterns you may understand how it works. After this, a grid paper may be the only thing you need to design your own pattern. Embroidery thread is yarn that is manufactured or hand-spun specifically for embroidery and other forms of needlework (also very good for making friendship bracelets). Friendship bracelets are special bracelets given from one friend to another as a symbol of friendship. They are handmade and usually made out of embroidery floss or thread. There are various styles and patterns, but most are based on the same simple half-hitch knot. The making of friendship bracelets is a version of macrame. A friendship bracelet type invented by the user Frosty. It is similar to a Zolino bracelet, but it's got elliptical shapes instead of squares. A pattern with zig-zag structured border, often made in several colors. A pattern generator is a tool you can use to create your own patterns, often a computer program. There are not many generators available, but they all try to convert user input into a pattern chart that is easy to read when making the bracelets. They can also speed up the designing process. The best paper for a pattern designer. This squared paper can easily be used to make alpha patterns, and if it is tilted 45 degrees, also normal patterns. The basic knot that makes almost all friendship bracelet patterns. It is basically one string looping around another loop (a half forward knot). The forward knot is made by making two half hitches to the right. The two included strings will be swapped. The word "forward knot" is often shortened to "fk". The the forward knot is in several pattern instuction types symbolized by an arrow pointing to the bottom right. The forward knot is made by making two half hitches to the left. The two included strings will be swapped. The word "backward knot" is often shortened to "bk". The the forward knot is in several pattern instuction types symbolized by an arrow pointing to the left. The forward backward knot is made by making one half hitch to the right, and then one half-hitch to the left. The two included strings will NOT be swapped. The word "forward backward knot" is often shortened to "fbk". The backward forward knot is made by making one half hitch to the left, and then one half-hitch to the right. The two included strings will NOT be swapped. This is the most common friendship bracelet type. The normal patterns are characterized by the diagonally lined up half-hitch knots. An average normal pattern is made out of 8 strings in two or more colours. A normal bracelet consisting only of forward knots can be called a candy stripe pattern. Macrame is a tying technique, originally from the middle east. The technique was before used for making advanced and beautiful fringes on table cloths and garment. It has now spread out all over the world by sailors, who still today is being regarded as kings of knots. Today, the largest field off application of macrame is in the Friendship bracelets. The original macrame style is often recognized by the thick and stiff fishing net. Of course, you can use any type of yarn, threads or line. A knot being associated with the technique is the macrame (aka square) knot. Another popular macrame art is tying on bottles. Then you typically use the fishing net or maybe a thin type of rope. The idea is simple, start at the top, in a ring, work your way down, and let the macrame get shaped by the bottle. This gives a very special effect, especially with the glass behind. The easy way of using three or more colours is just by varying the background color strings. The colors will go through the bracelet, being in the same position. In this way, you can for example write a text with letters that are one color in the top and another color at the bottom. The other way is more complicated. The goal is to make the "letter" color vary from letter to letter through the bracelet. One solution is to replace each letter string with two, three or more strings in different colors. The tying procedure continues as normal, but when it's time to make a knot in the letter color, only one of the strings in the "cluster of strings" is used. The knot will then be the same color as the chosen string. A bracelet made out of soda can pop-tabs. The zig-zag bracelet is actually a normal striped bracelet with a direction change every Nth row, N usually being at least 3. A zolino bracelet is a special version of friendship bracelets. It is like two zig zag bracelets connected in the middle, giving an effect of square leafs lying on each other. This is a simple bracelet, usually made out of two thick strings and six thinner ones in rainbow colors. The thick strings go through the bracelet in a wave-like shape, and the other strings makes knots on top of these. The wave bracelet can also be called "Double wave bracelet" if there are two thick strings. The original author of this tutorial is Stefan, but it has also been edited by k_marie, Kestrel, Alicat and Penguinshann. The tutorial was last updated 5 years ago.